Recommended to: Everyone. Seriously. I wish this read by every person of every age. It's that amazing. Thirteen-year-old Salamanca Tree Hiddle's mother has disappeared. While tracing her steps on a car trip from Ohio to Idaho with her grandparents, Salamanca tells a story to pass the time about a friend named Phoebe Winterbottom whose mother vanished and who received secret messages after her disappearance. One of them read, "Don't judge a man until you have walked two moons in his moccasins." Despite her father's warning that she is "fishing in the air," Salamanca hopes to bring her home. By drawing strength from her Native American ancestry, she is able to face the truth about her mother. I wish I had found Walk Two Moons when it first came out. In fact, I wish it had been on my reading list in school because I know I would have eaten it up. I know this because, despite my current age, I still fell deeply in love with this book. It's ageless, and it's wonderful. Salamanca Tree Hiddle (Sal)is a thirteen year old narrator who will steal your heart. We embark on a car trip with Sal and her eccentric grandparents, all the while learning bits about their lives, her life, and the life of her best friend Phoebe. Let me please tell you how much I loved each and every character in this book. Sal is sweet, kind and witty far beyond what her age dictates. Her grandparents are the picture of what true love really is. Even Phoebe, the girl who worries about everything, fits perfectly in the story. There is everything to love in Creech's characters and they make the story come to life. Sharon Creech weaves the stories of Sal and Phoebe into a story that took my breath away. A story that is funny, honest, and at times so heartbreaking that you'll find yourself teary eyed. During the car trip Sal's thoughts take the reader on a journey through her innermost self. I adored watching her grow, make observations, and just become even more amazing. I'm not even certain I'm making sense at this point. That's how much Walk Two Moons threw me off. It's beautiful. This is a must read for people of all ages, but I definitely suggest you put it in the hands of your middle grade reader as soon as possible. Young readers will learn from, and walk with Sal. Older readers will get the chance to revisit some of those hidden feelings we hide. The raw ones that we push down as we grow up. It's a wonderful, and terrifying, feeling all at the same time. 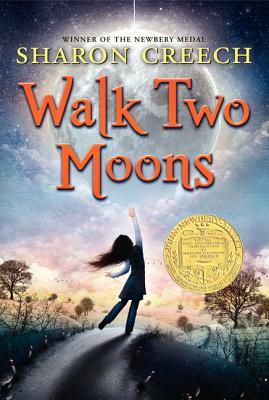 In my opinion, Walk Two Moons is a book that will make a reader out of a non-reader. I sincerely hope you love it as much as I did.